Equibase Analysis: Who’s Gonna Grab The Arlington Million? The field for the 36th running of the Grade 1, $1 million Arlington Million consists of 11 horses including three coming in from Europe for the hefty purse and a “Win and You're In” starting spot in the Breeders' Cup Turf less than three months from now at Churchill Downs. Last year's third place finisher Deauville (IRE), who has earned more than $1.25 million in his career, ships in for world class trainer Aidan O'Brien on a pattern identical to last year as he most recently missed by inches in the Group 3 Meld Stakes in Ireland. Century Dream (IRE) enters the Million off a pair of fourth place efforts in big races at Ascot and returns to a left handed course where four of his last five wins have come. Among the best horses of the American contingent, recent Grade 1 Manhattan Stakes winner Spring Quality may have a slight edge after an eye catching 11th to first rally when last seen. Robert Bruce (CHI) wasn't far behind in the Manhattan as he was a total of five necks behind the winner in a blanket finish. Oscar Performance won the Grade 1 Secretariat Stakes over the course last year as a three year old and makes his second start of 2018 following a seven month layoff, having won the Grade 3 Poker Stakes in June. Money Multiplier and Divisidero are proven at the level, having finished first and second, respectively, in the Grade 2 Monmouth Stakes in May, with Divisidero winning the Grade 3 Arlington Handicap since then and with Money Multiplier second in the Grade 1 United Nations Stakes following the Monmouth Stakes. Catcho En Die (ARG) was 10th in the Manhattan but returned to top form to win the Grade 3 Stars and Stripes Stakes at Arlington last month, with Twenty Four Seven sixth but beaten just two lengths in the race. Almanaar (GB) was a group 3 stakes winner in France but that was back in 2015. However, he enters the Million off a win following 16 months off and has room to improve. Circus Couture (IRE) rounds out the field and appears overmatched as his last two wins, in Italy, came in allowance races. Century Dream (IRE) will be my top choice to win this year's Arlington Million based on his obvious desire to win and a liking for tracks like the one he will be running over at Arlington Park. Last fall as a three year old, Century Dream (IRE) won back to back on left handed (counter-clockwise) courses like those in North America, the second of those wins at the Million distance of a mile and one-quarter. Given six months off to mature, he began his four year old campaign with a dud when 11th in the Group 2 Prix d'Harcourt in France, but that was run on a very wet course and he may have needed the race. Returning to England in May, Century Dream (IRE) once again won two races in a row including the important Group 1 Diomed Stakes, his first race of the year on a left handed course. Beaten just three-quarters of a length in the Group 1 Queen Anne Stakes in June and fourth against some very tough competition in the Group 2 Summer Mile Stakes in July, both at Ascot and both on the straightaway course at a mile, Century Dream (IRE) stretches back out to the 10 furlong trip he won at last fall and more importantly returns to a two-turn race on a left handed course which he appears to do his best running over. Considering he earned a career-best 122 Equibase Speed Figure in the Queen Anne, better than Deauville (IRE) earned when narrowly missing winning this race last year and almost on par with the 126 field-high figure Spring Quality earned in the Manhattan Stakes in June, Century Dream (IRE) should be a strong contender in this race. Robert Bruce (CHI) and Spring Quality were separated by a length when sixth and first, respectively, in the Manhattan in June, with Spring Quality earning a career-best 126 figure with his eye catching rally from 10th with a quarter of a mile to run and with Robert Bruce (CHI) earning a 124 figure which was also the best of his career. Robert Bruce (CHI) entered the Manhattan with an unblemished record of seven-for-seven and should run as well or better making his third start since importing to the U.S. and being rested six months, while Spring Quality could easily bring his career record to seven for twelve with a win by repeating his Manhattan effort. Deauville (IRE) is a world class runner but one prone to finishing second over finishing first as he now has six career runner-up efforts to go along with four wins. Last summer Deauville (IRE) ran the best race of his career in the Million (117 figure) when stalking in fourth early then rallying to lead in the stretch. Although he battled gamely to the wire, Deauville (IRE) came up a half-length and a neck short of victory. Returning to the races this past April after a four month rest, Deauville (IRE) finished second in a stakes then ran poorly in two straight in which he led early, returning to competitive form last month when second, beaten a neck, in the same prep race he used last year for the Million. Considering world class trainer O'Brien brings over his #1 jockey in Ryan Moore just as he did last year and after Moore did not ride Deauville (IRE) in his last three races, it is likely Deauville (IRE) is ready to repeat or better his very competitive effort from one year ago. Oscar Performance is a lightly raced four year old with a more than respectable record of seven wins in 12 starts including a perfect two-for-two record at this mile and one quarter turf trip. One of those wins came last year on this date when, as a three year old, he won the Secretariat Stakes rather easily with a then career-best 116 figure. Following that, Oscar Performance faced older horses for the first time and finished third in the Turf Classic Invitational, won by Beach Patrol, who had won the 2017 Million one month earlier. He then proceeded to finish ninth in the Breeders' Cup Turf to end his 2017 campaign. Following seven and one-half months off, a well-rested and more mature Oscar Performance won the Poker Stakes in June with a new career-best 118 figure. Having proven capable in top company and with a liking for the course and distance, Oscar Performance could take a big step forward in his second start of 2018 and is yet another with a chance to win. The rest of the Arlington Million field, with their best representative figures is: Almanaar (GB) (111), Catcho En Die (ARG) (121), Circus Couture (IRE) (98), Divisidero (113), Money Multiplier (113) and Twenty Four Seven (101). Note: Equibase Speed Figures for foreign races are available through STATS Race Lens and TrackMaster products. 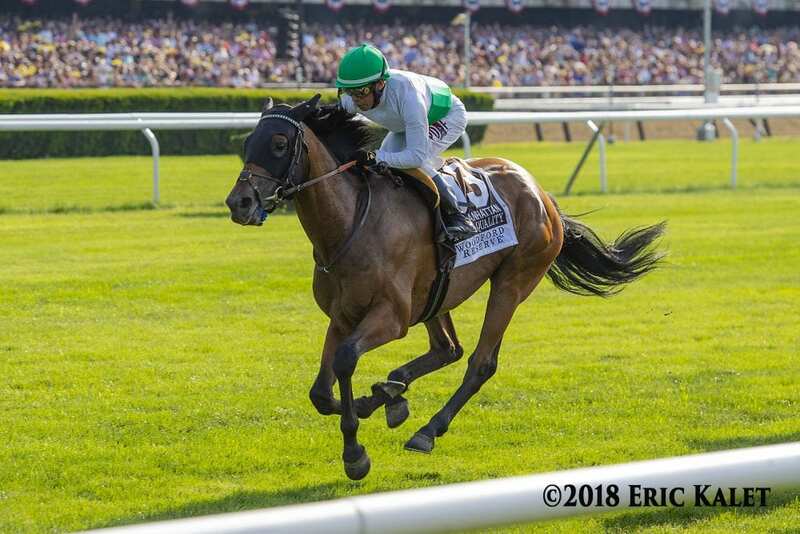 This entry was posted in Horseplayers, NL List and tagged arlington million, Ellis Starr, equibase, equibase analysis, Handicapping, horseplayers by Ellis Starr. Bookmark the permalink.